For strategic or “personal” reasons, Apple didn’t buy any Facebook advertising to promote the launch of its Apple TV+ service, last month. 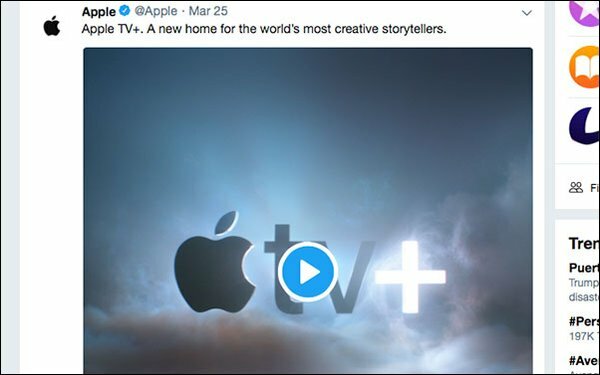 In fact, Twitter was the only social-media platform from which Apple bought ad inventory to promote Apple TV+, according to a new report from social-marketing startup BrandTotal. Of course, the hostility between Apple and Facebook is no secret. Yet, Alon Leibovich, cofounder-CEO of BrandTotal, thinks the move had more do to with sound strategy than anything else. “Twitter has always been Apple’s go-to social marketing platform,” said Leibovich. “They’ve used it to successfully promote their hardware business for years. “It’s also notable that Apple remains off of both Facebook and Google ad networks when it comes to paid campaigns,” Leibovich added. For its findings, BrandTotal analyzed all paid social ads for Apple TV+ in the United States between March 25 and March 29. The analysis covered Facebook, YouTube, Instagram, and Twitter, and included “dark” as well as public campaigns. Also of note, all Apple TV+ ads on Twitter were dark and hidden from public view. “Dark marketing” refers to social-media ads that are only shown to carefully targeted audiences. In total, BrandTotal counted four pieces of creative -- each a one-minute and 35-second video -- used to promote Apple TV+. While the ads were essentially identical in terms of messaging, creative and length, each targeted a different group and audience, BrandTotal found. Specifically, Apple changed strategy to target younger, single male consumers, the firm found. On Twitter, Apple promoted Apple TV+ to a 61% male audience, and a 39% female audience. Apple mostly targeted millennial uses (29%), and middle-aged users (22%), and especially those who are single (58%). Historically on Twitter, the company has targeted more married (50%) women (58%), and fewer men (42%) ages 45-to-54 (25%). Leibovich said this represented a big shift from Apple’s usual targeting strategy. “Going after the millennial and middle-aged, single male audience shows Apple wants to appeal to cord-cutters,” Leibovich noted.